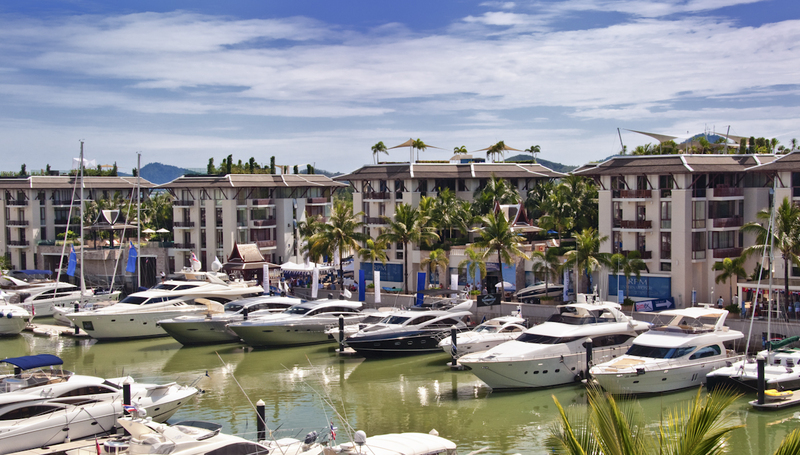 Royal Phuket Marina (RPM) is strategically located along the centre of Phuket’s eastern seaboard, on the doorstep of Thailand’s famous Phang Nga Bay. 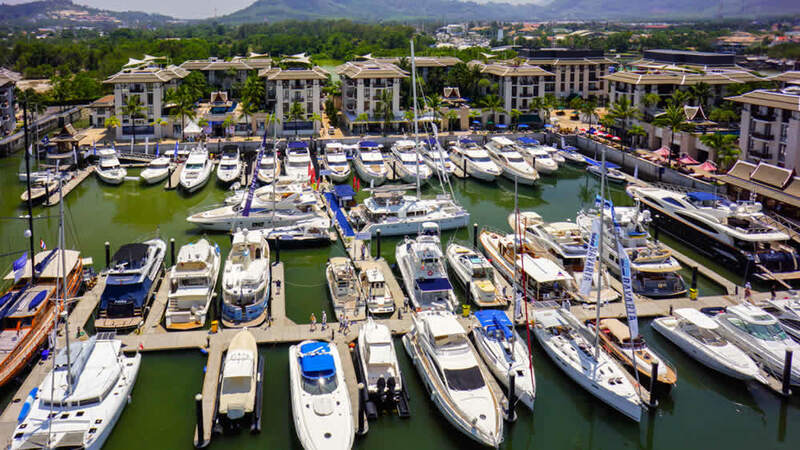 The marina is Thailand’s first world-class ‘luxury lifestyle marina’ and has been developed over 30 hectares (190 rai) of prime land, right next to Phuket Boat Lagoon in Koh Kaew. 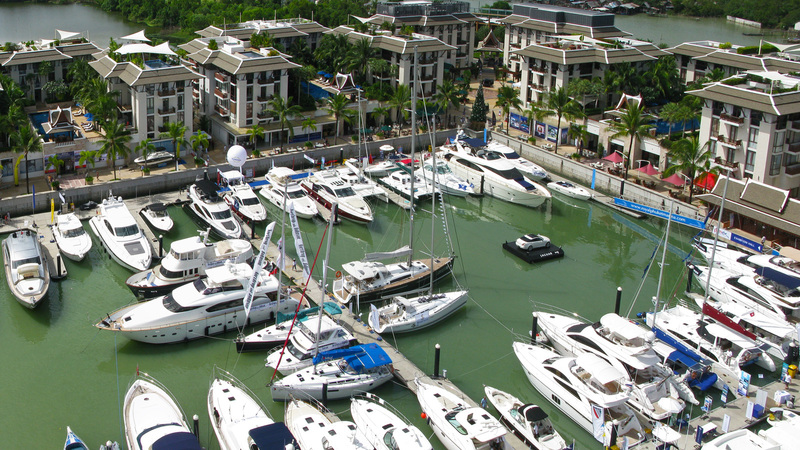 With 350 berths for yachts of up to 35 metres long and 400 luxury waterfront villas, penthouses and condominiums, the marina ranks among Asia’s premier boating hubs. 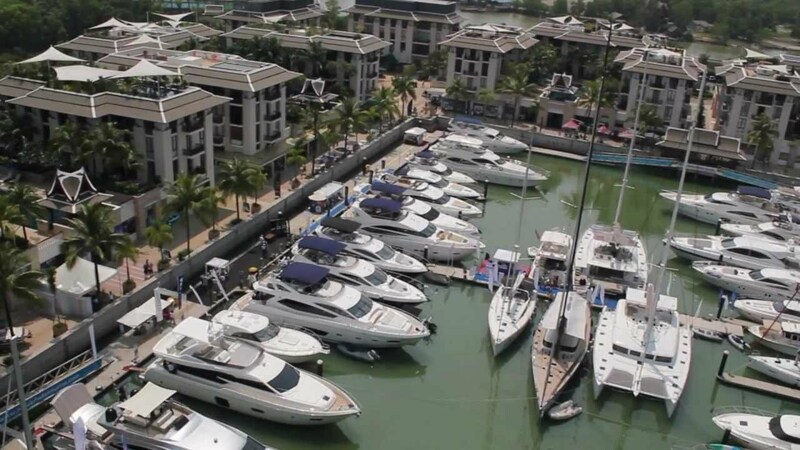 It is Asia’s most sophisticated and high-tech yachting infrastructure and the island’s only marina with a boat lock, non-tidal deepwater basin and private moorings on the doorstep of residences. 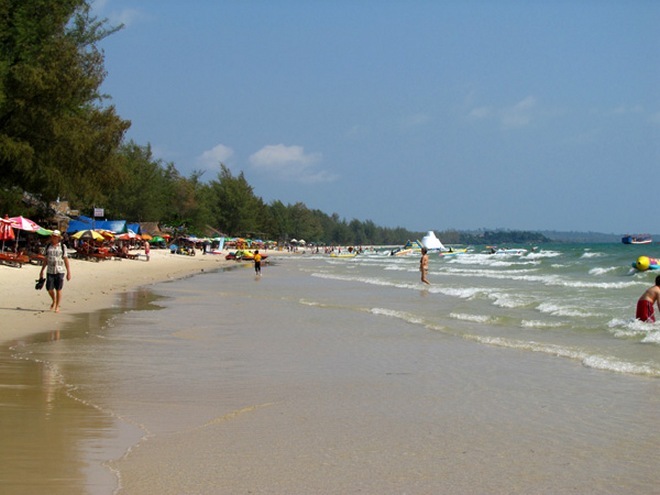 Sihanoukville town sits in the center of a small peninsula that juts into the warm waters of the Gulf of Thailand. Several beaches of fine pearl-white sand line the shore around the peninsula, most easily accessible from town, each separated as much by character as the rocky headlands between. The main beaches are lined with thatch roofed seafood shacks and bars offering cold drinks, umbrellas and chairs, BBQ and more. Ochheuteal and Serendipity Beaches are the most popular and the busiest with plenty of nearby hotels, guesthouses, bars and restaurants. 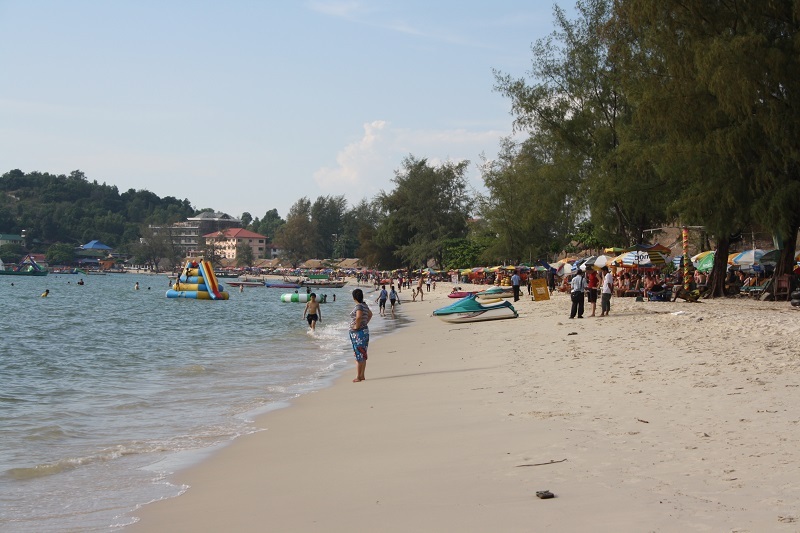 A bit farther from town, Sihanoukville’s out-of-the-way beach Otres continues to grow in popularity, but is still maintaining its relaxed, laid-back vibe. On the other side of town, Independence Beach, though small, offers a pleasantly tranquil atmosphere and beachside bbq shacks. Ochheuteal Beach is by far the most popular and touristed beach in town. Ochheuteal is long, sandy and comparatively narrow, with ‘Serendipity Beach’ at the arcing northern end, most of the southern half closed to the public, and a small cluster of beach restaurants at the pleasantly quiet far end. Most of the hotels, guesthouses and restaurants are on and around the northern half of the beach. Otres Beach is the next beach south of Ochheuteal and is similar in many ways. Like Ochh-euteal, Otres is a three kilometer cre-scent of white sand facing southwest. But Otres is somewhat more thinly touristed, offering a more relaxed, chill-out atmosphere. Beach shacks and guesthouses/bungalows line the near and far ends of Otres with the central section now public pack and open beach without any businesses. Independence is the quieter, more relaxed near-town beach. The beach is better than a kilometer long, but more than half is closed for a development project. A long slice at the north end remains open to the public – a lightly touristed 500 meter strip of sandy beach, sporting a dozen beach front BBQ huts, restaurants and bars including one of my favorites, The Small Beach Bar, from the same people as The Small Hotel in town, serving very good western food and Swedish specialties in addition to the usual seafood BBQ and such. A good place to escape the crowds of Ochheuteal Beach. Victory Beach sits at the base of the popular Victory Hill. Victory Beach offers one of the best sunset views in town but unfortunately the beach is partially closed and there are no longer any bbq shacks or other vendors. Farther north along Victory the beach narrows and a few upscale seafood restaurants hug the water’s edge and a couple of casinos can be found on the beach road. 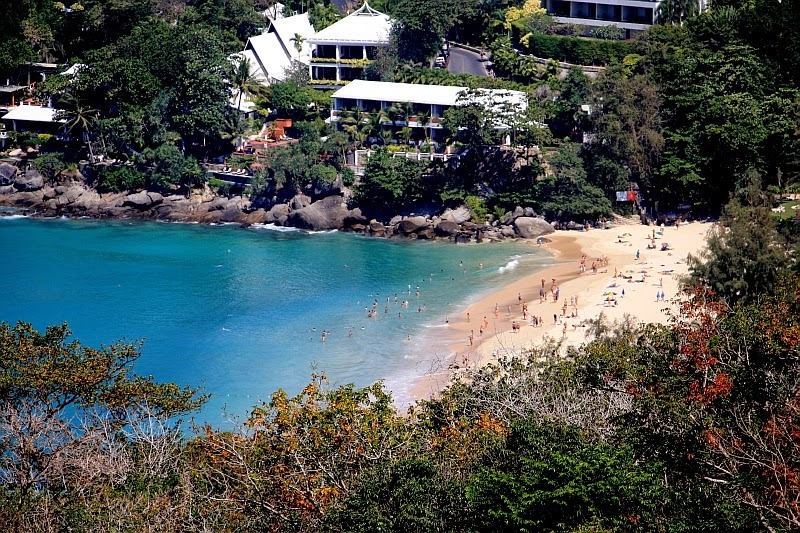 Above Victory Beach, Victory Hill offers a variety of guesthouses, restaurants and bars. Several places, both budget and mid-range dot the side of the Hill overlooking the ocean, some offering excellent sunset views. Occupying all of Sokha Beach, the Sokha Beach Resort offers luxury accommodation and fine dining. 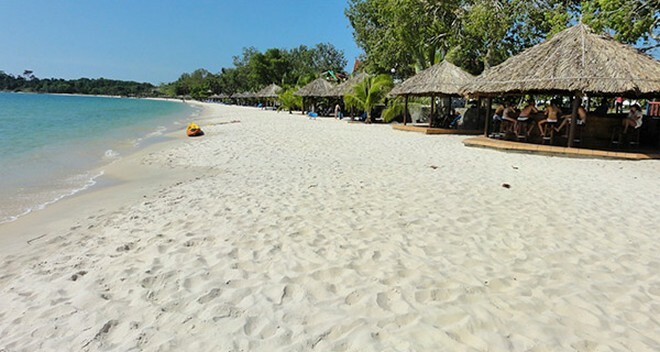 Sokha Beach is a beautiful beach, a crescent of sand about one kilometer long and comparatively wide. The fine pearl white sand is perfectly groomed these days but the beach is fairly quiet, frequented primarily by resort guests. There aren’t any little seafood shacks, but dining gazebos and an up-market beach bar / restaurant run by the Sokha Beach Resort. 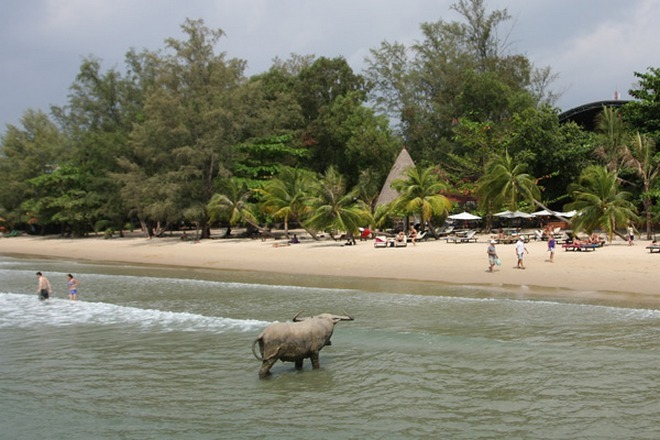 A distant beach, 27 kilometers north of town, Ream Beach is long and narrow, sitting at the edge of Preah Sihanouk (‘Ream’) National Park. The beach is largely untouristed and of very average quality. Long but very narrow with a mix of fine and coarse light tan sand. Another distant beach, Prek Treng is a long, wide crescent of brilliant white sand a few kilometers north of town, offering comparatively warm shallow waters. The beach is in good shape, groomed and landscaped, but is usually all but deserted. Picnickers do show up on the weekends and sometimes during the week, but there are rarely more than a few groups there. Sometimes a couple of food shacks stand open at the near end. To get there follow Hun Sen Beach Drive north a few kilometers past the port area.Best to bring along some of your own drinks and snacks. 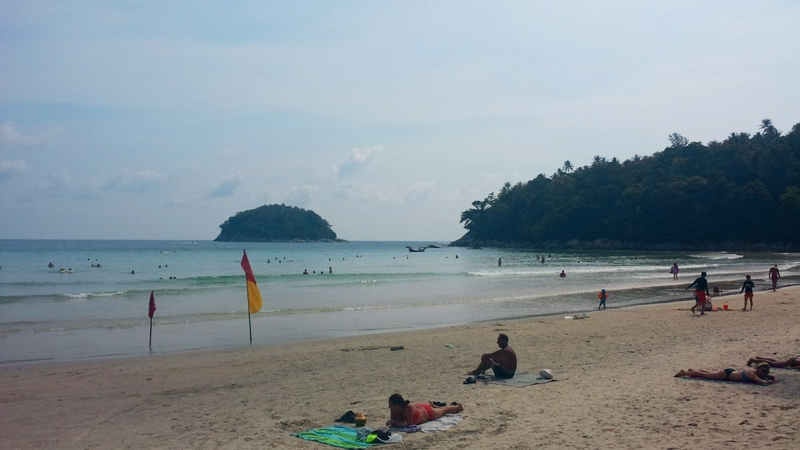 Phuket has many beautiful beaches and a lot of exciting activities can be found on this island. 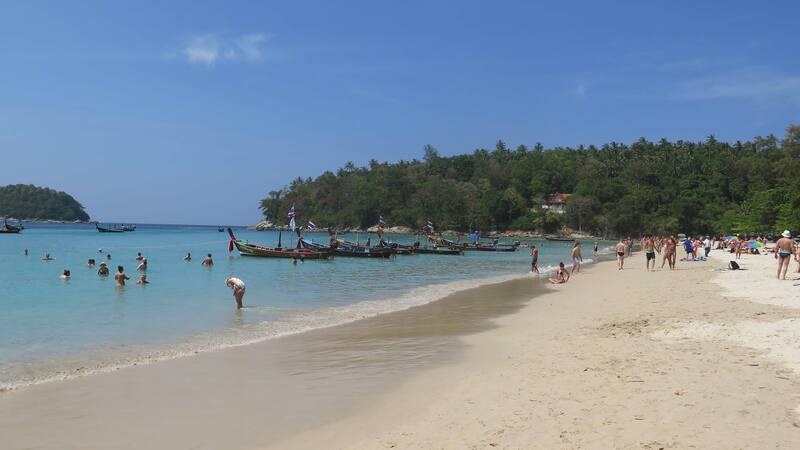 Phuket is located approximately 862 kilometres south of Bangkok. There are only two seasons in a year the green season (May to October) and the hot season (November to April). 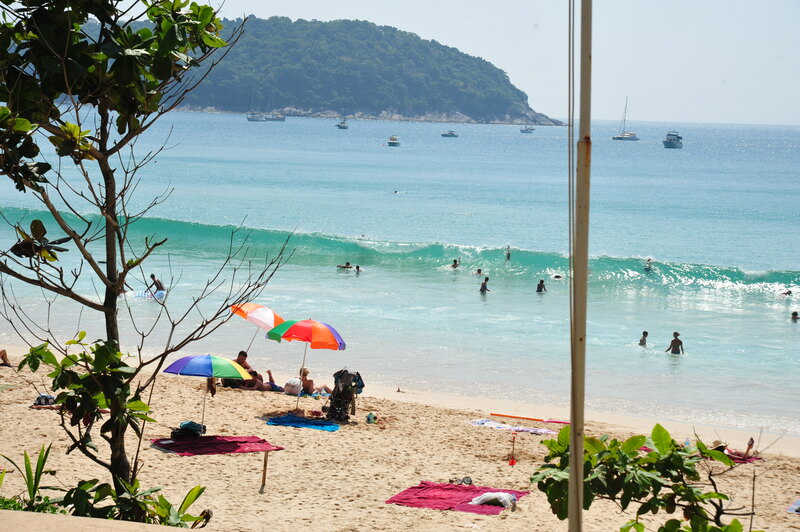 Phuket is divided into 3 administrative districts: namely, Mueang District, Thalang District and Kathu District. Phuket is one of the most important tourist destinations in Thailand with a wide variety of magnificent coves and bays, lush green hills, palm-fringed white beaches, secluded bays and forested hillsides, smaller surrounding islands, hospitable people, superb accommodation and seafood, delightful turn-of-the-century Sino-Portuguese architecture, numerous sporting and leisure opportunities – all of which combine to create delightful and truly memorable holidays. 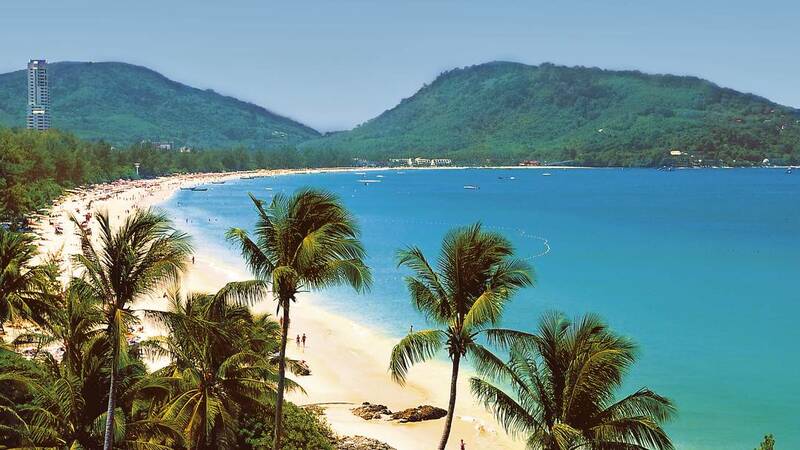 The most famous beaches of Phuket are Patong, Kata, Karon, Kamala and Nai Harn Beach. 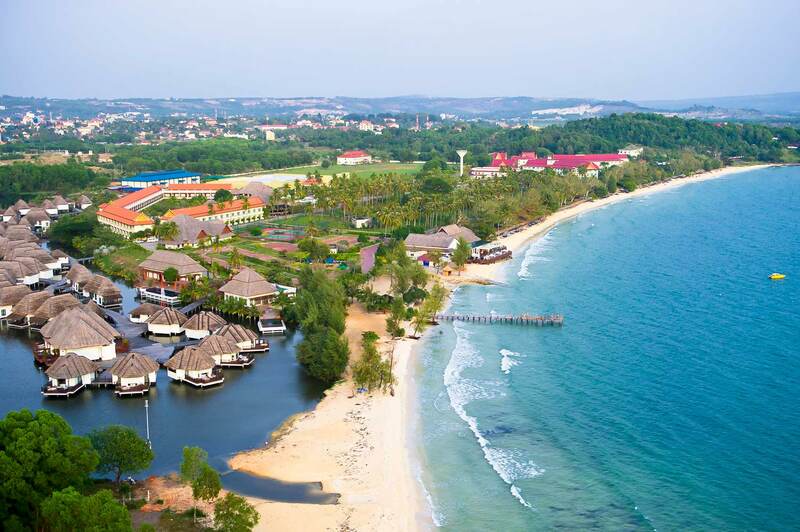 These beaches are ideal for diving & snorkeling, sailing, golfing and all kinds of sports & entertainment. Pattaya one of the most famous nightlife cities of the world. Pattaya one of the most famous #Nightlife cities of the world. 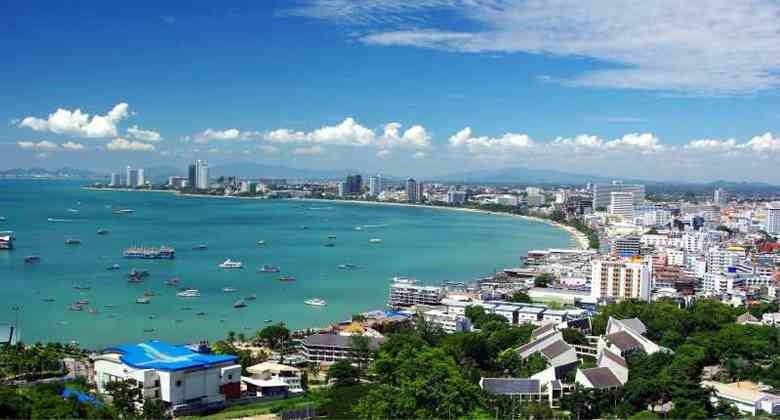 Pattaya Life is a site dedicated to the city of Pattaya, a Thai beach resort that is quite popular with tourists and expatriates alike. 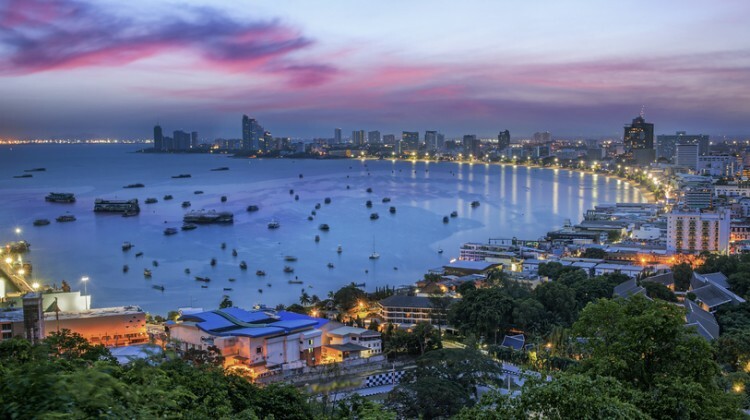 Pattaya City lies 147 kilometers southeast of Bangkok, facing the Gulf of Thailand. It is considered as one of Asia’s premier beach destination that attracts a lot of families, couples, and single visitors who want to relax and explore some beautiful sceneries. 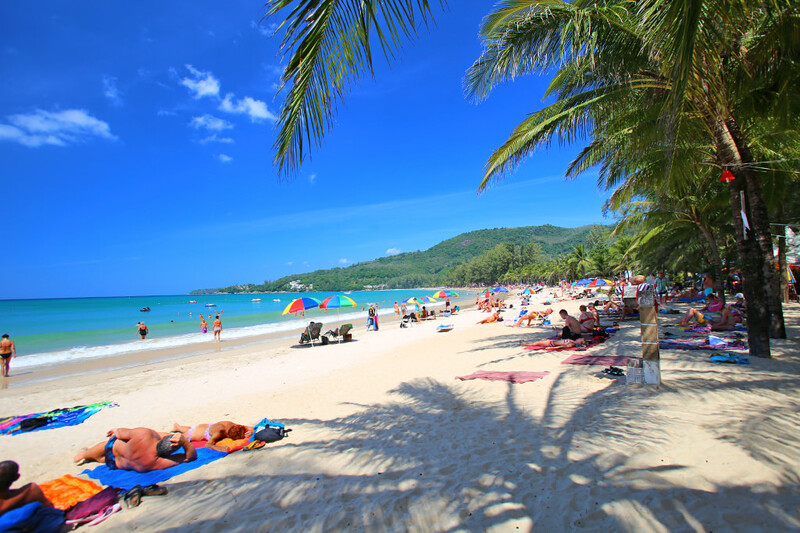 Jomtein Beach: This beach is a straight six-kilometer sandy beach that is located around two kilometers from South Pattaya and four kilometers from the city proper. The place is well-renowned among people who enjoy the tranquility of the area. The beach is also a peaceful place, considering the fact that property development of hotels, resorts, and condominiums. 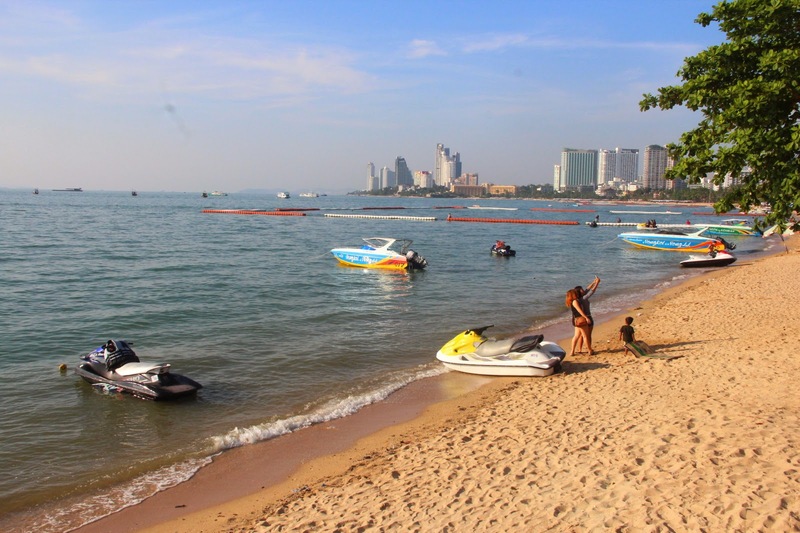 Central Pattaya: Also known as “Pattaya Klang”, it is considered as the most popular beach among the city’s three beaches. The beach is well-known for its brown-red sand, attractive accomodation options, as well as all types of facilities and amenities. Beach activities in the area include banana boat, jet ski, and paragliding. North Pattaya: Also known as “Pattaya Neu”, is located adjacent to Haad Wong Ammat. It begins from the Dolphin roundabout and right in front of Dusit Resort. It is regarded as the most quiet beach among the city’s three beaches. 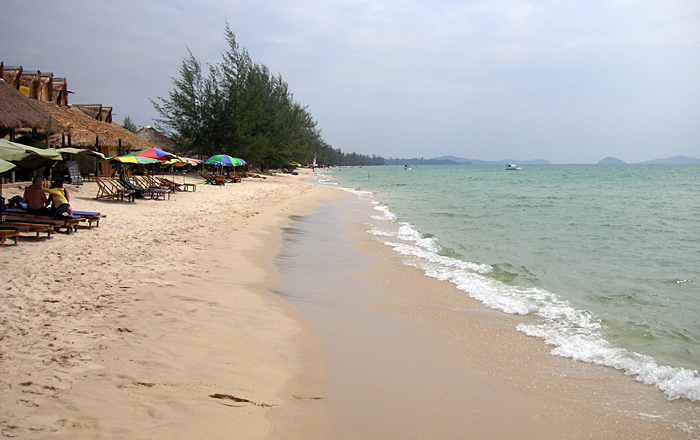 South Pattaya: Also known as “Pattaya Tai”, is situated next to the southern end of Pattaya Beach. The area extends inland to the north and south of the South Pattaya Road. Furthermore, South Pattaya includes Pattayaland and Walking Street.